The limestone cliffs of the White Rocks ends abruptly against a dark basalt outcrop which is majestically crowned by Dunluce Castle and joined to the mainland by an arched walkway, underneath lies the ‘ Mermaid’s Cave’. It is believed that the castle was built or (possibly) rebuilt by Richard de Burgh or one of his chief followers during the Anglo Norman period in Ireland. The site certainly was occupied as a fort before this time, a souterrain exists on the outcrop under one of the towers. The most colourful occupier of Dunluce Castle was Sorley Boy MacDonnell, a Scottish chieftain whose clan established their dominance along the north coast in the mid 1500s. It was lay seige to on several occassions during its long history, three examples were: 1584 - Queen Elizabeth dispatched Sir John Perrott (the Lord Deputy of Ireland) from Dublin with an army to arrest Sorley Boy MacDonnell - he lay siege to Dunluce on September 14th 1584 and on the third day the castle surrendered - Sorley had flown the nest before his arrival and evaded arrest. The castle was held by Perrott for one year, Sorley re-took it on his departure. 1641 - It was unsuccessfully besieged by an Irish army - the village of Dunluce was destroyed but the castle held out under the command of a Captain Digby and was relieved by the Earl of Antrim in April of that year. 1642 - in July General Munro arrived with a thousand foot soldiers, two troops of cavalry and field guns, acting under the orders of the Marquis of Argyll (an enemy of the Earl) he arrested and imprisoned the Earl in Carrickfergus, he also ransacked Dunluce and other castles belonging to the Earl. The castle which has seen many additions to its original structure over the centuries gradually fell into disuse from the late 1600s’ when the last occupier, Randall MacDonnell, the second Earl of Antrim moved to Ballymagarry House. In the mid 1700s the seat of the Earl’s of Antrim moved to the present location of Glenarm Castle. A thriving merchant village that once surrounded the castle was destroyed by fire during 1641 when the castle was besieged by an Irish army, the outlines of some of the old walls can still be seen in the land to the west of the castle. Close by is the ancient church ruins of St. Cuthbert’s named after a Northumbrian monk and the (possible) burial site of sailors and noblemen from the Spanish Armada. On a clear day you can look over an expanse of ocean from here to Donegal and round to Islay, a view which has remained unchanged for centuries. It was within this view that the tragedy of the emigrant ship the Exmouth took place in April, 1857, bound for Quebec, she spent almost three days in horrendous sea conditions before finally breaking up on rocks off Islay with the loss of 240 lives - her story is told here. Guided tours are also available if booked in advance. When closed you can still walk down a long series of steps, past the wishing well and the mermaid’s cave, to the stone arch with views to the Skerries and Inishowen, Donegal. The ruins of St. Cuthbert’s lies a short walk away from the castle grounds - on the small road opposite the Portrush entrance to the castle. Walking around inside Dunluce Castle is a fascinating experience - it is only when you walk down from the gift shop and cross the bridge into the castle courtyard that you realize how large the castle layout actually is - something that is not so apparent from outside views. Over the years many changes and additions have occurred to the original structure - inside you will find Norman, Scottish, English and European architectural influences. The castle was given to the Northern Ireland Government by the Earl of Antrim in 1928 to be preserved as a National Monument, since that time the Department of the Environment have taken great care of it. It is obviously a constant process to maintain and preserve such a large artefact of our past and the Department have done this exceptionally well - many skilled workers have been employed in replacing, renovating and preserving the structure over the past decades - for our continual enjoyment. 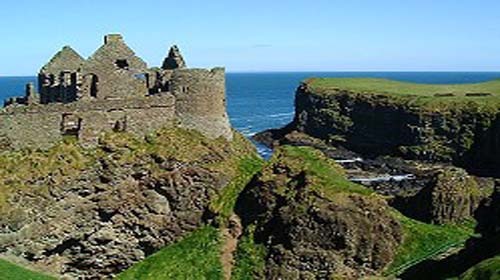 Dunluce Castle is mentioned in the fourteenth century as one of the properties of de Burgo or de Burgh in the Earldom of Ulster, it is believed to have been built in the site of an earlier fort by Richard de Burgh or one of his chief followers in the thirteenth century. The castle was taken by force from the McQuillen’s by Sorley Boy McDonnell after the Battle of Orla in 1565. In one account we read of the McDonnell army covering a boggy area with rushes and positioning men on a few clumps of firm ground with the effect that the McQuillen’s charged straight into the bog and got caught, becoming easy victims to the McDonnell soldiers on the firmer ground. A traditional local saying goes - ‘There’s been nobody fooled by a rush bush but a McQuillen’. There are references to Sorley Boy McDonnell’s flying, much to the displeasure of the Queen Elizabeth 1st, a battle standard captured after a skirmish with the English, he is also reputed to have mounted four cannons salvaged from the Girona along the castle walls. The Girona was a Galleass of the Spanish Armada which foundered on Lacada Point at the Giant’s Causeway in 1588, local folklore tell of victims being buried in St. Cuthbert’s graveyard nearby Dunluce Castle. The McDonnell’s also held a ‘St Columcille Cross’ named after the Irish saint, this was taken along with other valuables after Sir John Perrott took the castle on instructions from Queen Elizabeth in 1584. The castle has seen lots of sieges and battles in its years, Sorley Boy eventually went to live in Dunaneenie and the castle came into the possession of his son Randal McDonnell. Randall set about restoring the castle and built a lavish manor house within the castle walls. He married the widow Lady Katherine Manners, daughter of the Earl of Rutland, her husband George Villiers, the Marquess of Buckingham was shot in Portsmouth by a disgruntled naval officer called John Fenton. In the late Dunluce Castle became their residence, an inventory dating from this period shows that the castle was indeed a fine residence. The Earl and Countess of Antrim frequented the royal court in London and acquired many of their possessions there. There were said to have been tapestries and exquisite curtains including a set which had belonged to Cardinal Wolsley at Hampton Court. The inventory lists six sets of chairs of state, which would have been placed under an elaborate canopy. Sixty other elaborately upholstered chairs and stools were at the castle including a library of books. There were saddles worked with gold and silver, finely inlaid cabinets and valuable objects such as telescopes, celestial and terrestrial globes. The most valuable listings are the priests vestments - the Countess is credited with establishing St. Cuthbert’s Church (nearby to the castle) it was originally thatched and is recorded as having a lavish interior which included the signs of the zodiac painted in the ceiling plaster. 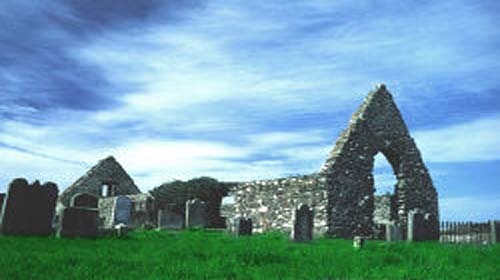 A village grew up around the castle had its own customs house at Portballintrae, merchants settled there and it became a thriving focus of commerce - evidence to this can be found in the many headstones within the old church graveyard. In 1639, while the second Earl and his Countess were here, part of the castle including the kitchens fell into the sea; seven cooks went with the kitchens but an itinerant cobbler was said to have survived in a corner of the vanished room. The 1641 rebellion saw the castle sieiged by an Irish army and the surrounding village burnt, the castle held out under the command of a Captain Digsby and was relieved by the Earl. Most of the Scottish settlers and merchants escaped to Scotland before the village was destroyed. General Munro arrived here in 1642 with a large army, some thousand foot soldiers, two troops of cavalry and field guns - he is said to have arrested and imprisoned the Earl in Carrickfergus, ransacked Dunluce and other castle belonging to the Earl as well as burning Glenarm.. 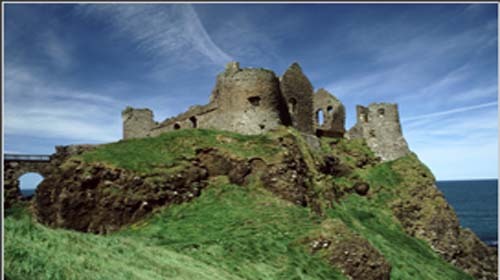 The Earl re-occupied Dunluce Castle after 1666 and lived there until his death in 1683. Oliver Plunkett, the Archbishop of Armagh who had at the time been recently canonized, was a visitor during this period and described it as a ‘palace washed on all sides by the sea’. After the Battle of the Boyne in 1690, which led to the impoverishment of the McDonnell because they had adhered to the cause of James II, Dunluce Castle was abandoned and Ballymagarry House nearby became the Earls of Antrim’s main residence, part of its structure and garden walls are still standing. A barn survives with a massive oak roof said to have come from Dunluce Castle after it was deserted. Ballymagarry was destroyed by a fire in 1745 after which Glenarm Castle became the principal seat of the Earl of Antrim. A short walk away from Dunluce Castle, on the Ballytober Road, lies the old church ruin of St. Cuthbert’s -built on the site of an older medieval church it was completed in the late 1630’s and is dedicated to the Northumbrian monk St. Cuthbert - during the period of early Christianity links were established between the Abbey’s of Armoy, Northumbria and Clonmacnoise with scholastic and spiritual exchanges taking place. The first Earl of Antrim Randall McDonnell married Lady Katherine Manners, daughter of the Earl of Rutland and widow to the Marquess of Buckingham, she is credited for the building or complete renovation of St.Cuthbert’s. 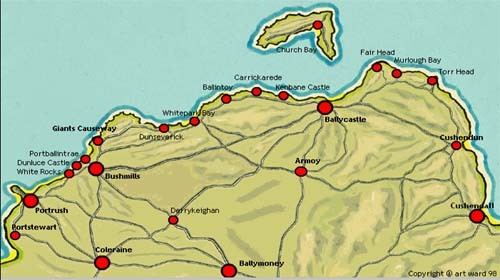 Both the Earl and Countess were of the Catholic faith yet provided places of worship for the mainly Protestant settlers in their territories of the Route and Glens - unique to find in 17th Ulster when religious tolerance was a rarity. The church was originally thatched and the interior white ceiling described in memoirs as being painted with the signs of the zodiac, it served the Parish of Dunluce from the late 1622s to1820 when the new church of St. John the Baptist was built in Bushmills.The graveyard has some fine headstones which convey the background to both the old merchant village of Dunluce and the surrounding Parish from 1630 onwards. Local folklore tells of sailors and noblemen from the ill fated Spanish Armada ship the ‘Girona’ being buried here in 1588. It is well accounted that the McDonnell’s had cannons mounted on the parapets and were also in possession of other artifacts from the shipwreck. Another artifact reputed to have come from the Girona and which was used in St. Cuthbert’s was a Muniment Chest (used for manuscripts and religious purposes) - so perhaps the stories of noblemen and Spanish sailors laid to rest in St. Cuthbert’s are accurate, it certainly make a walk around St.Cuthbert’s even more fascinating. Currently the oldest readable stone dates to 1630 and marks the burial site of children belonging to Walter Kid, a merchant in Dunluce and Burgess of Irvine - ten years after the pilgrim Father’s landed in New England. The first known vicar of St.Cuthbert’s was a William Wallace from 1622-35, he also covered Dunluce and Portcaman, Ardclinis and Derrykeighan, were he resided. In 1634 it is written that he was contemplating emigrating to New England. He was also a benefactor if the will of a William Boyd which was executed by a Thomas Boyd of Carncoggie - an early Scottish Settler in north Antrim.